I love cooking a roast chicken. Even the most straight forward preparations or they are tender and delicious. 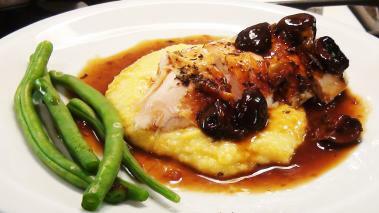 In this recipe video, the chicken itself is simply prepared; as is some cheesy polenta; as is an easy mushroom sauce. But the combination of the three, create a complete meal, with complex flavors and textures – perfect for Sunday supper any time of the year, but especially as summer starts to fade, the weather turns cooler, and the meals start to get heartier. Obviously, roasting a chicken isn’t a 20 minute meal…but pretty much everything can be done easily in less than 2 hours, including prep time, and we’re going to make the sauce and polenta while the chicken cooks. And…you’ll have some leftovers for a quick meal during the week. Hope you enjoy it as much as I do. The polenta should be soft is in about 30 minutes. If needed you can add additional water as it cooks to prevent it from sticking or burning. After the pan sauce has reduced, add some water to the cornstarch, to form a slurry and little by little add the slurry to the sauce, stirring as you go. Continue until you get the desired thickness. Taste the sauce, you can either add more salt/pepper or thin it out with more chicken stock or water.